Home > Hadogenes Paucidens recommendation. Pros: Hadogenes Paucidens (Or Olive Keeled Flat Rock) is a Scorpion with a stunning Black appearance with a touch of brown and bright yellow stripes along the top of its Exoskeleton. 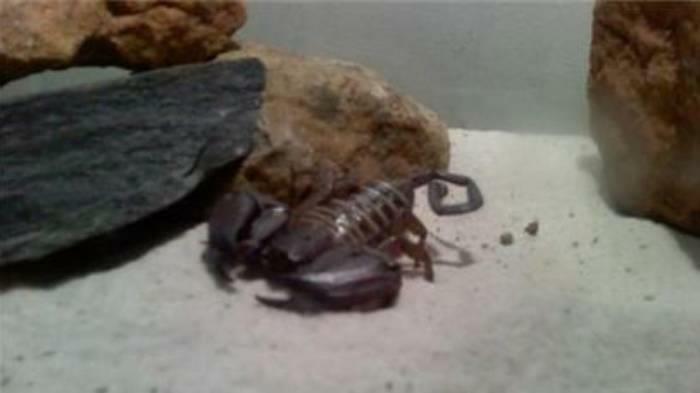 They are an easier Novice scorpion to keep than others considering that their main needs are sand (which can be acquired at a store such as Lowes, Walmart, or Home Depot) a wide shallow water dish, and rocks to hide under, they also require high humidity, and of course an aquarium. you can acquire rocks from just about anywhere that chemicals haven't been used, however you can also acquire slate rock for a low amount from a construction company. As with all scorpions, they are nervous when first approached to handle, however if they are on a rock you can easily get them to crawl onto your hand with little stress to the scorpion, they are great eaters as well. Cons: All scorpions are nocturnal so there is a very low chance for them to be seen during the day, so unless you intend to stay up later than normal you may not see the scorpion. They always hide during the day, and also hide in different places alot of the time. These scorpions CAN NOT be kept communally unless they are given a LARGE aquarium (probably 20-30 gallon or so) and kept as a breeding pair with many hides and such, and they also must be fed well since these scorpions are territorial and will attack if hungry and provoked. Out of the scorpions I have observed from others and myself, this is one of the more nervous novice scorpion species, being that they are quick to hide rather than protect themselves. Also all scorpions are mainly shelf pets and should not be handled much due to causing unneeded stress. Overall: The Olive Keeled Flat Rock (Hadogenes Paucidens) is a stunning beginner pet, but it requires slightly more maintenance than other species due to needing somewhat humid and hot temperatures, which may be harder for others to replicate, they are also one of the more nervous novice scorpions, that should be kept alone unless you are an experienced breeder.